I'm planning a few vacations this summer - The first being a ten day road trip to three southern cities. I can't wait! The downside to road trips is the limited space for luggage, so my crew decided on one carry-on and one knapsack per person. NOT GONNA HAPPEN! My Toy Poodle, Teddy, can fill a cary-on suitcase on his own (he's packing lots of toys). Luckily, I found this oversized tote.. 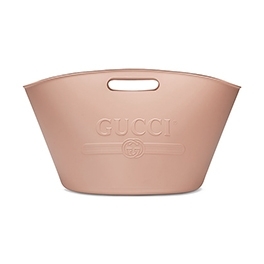 I'm obsessed with this Gucci Logo Top Handle Tote (available at Gucci). The light pink rubber is the perfect shade for summer. This tote is HUGE and great for road trips. I struggle to fit everything in my small suitcase, so an oversized tote is essential for extended vacations. The rubber is thick and structured to resemble a vintage beach bag. The front of the tote is embossed with the Gucci vintage logo and the bottom embossed with "XXV", "Sine Amore Nihil", "Summer MMXVIII" and "Guccification". LOVE! These "Walk'In'Dior" low-top trainers in white canvas (available in Dior boutiques only) are from the Dior 2018 Cruise Show and impossible to get. The canvas sneakers have a rubber sole, gold-tone hardware and don "Cristian Dior J'Adour" printed laces. LOVE! 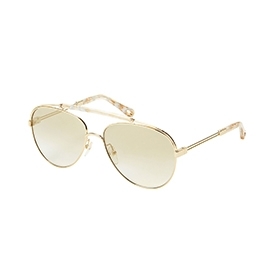 These Chloé gold-tone sunglasses (available at Intermix) have a horn brow bridge and earpiece. This design is smaller than the typical Chloé sunglass style and I do love oversized sunglasses, BUT the horn detail is a delicate touch to the otherwise masculine aviator style. I posted these sunnies in a previous 'I'm Coveting..' post and still fancy a pair. HINT HINT.. The latest Fenty Puma by Rhianna collection is "beachy and badass". I'm a big fan of Fenty and can't wait to see what Creative Director, Rhianna, will design each season. These surf-inspired Fenty women's Terrycloth dolphin shorts (available at Puma) look so comfy. The checkered print along the back waistband gives these shorts a motocross vibe and this color will look great against sun-kissed skin. These shorts are also available in a vibrant blue and cream. My favorite accessory on this month's "I'm Coveting.." post are these Rylee skinny calfskin boots by Chloé (available at NET-A-PORTER). The cloudy yellow shade is gorgeous. 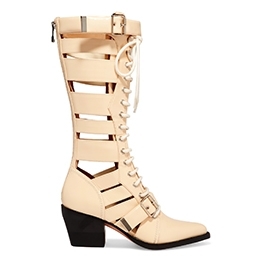 These slightly glossed, lace-up boots have a buckle at the top and across the vamp. The cutouts and buckles give these Rylee boots a warrior princess vibe. They're also available in medium - ankle boot style. 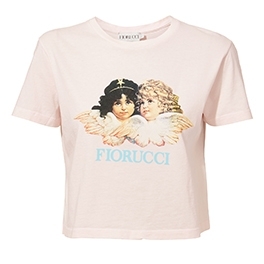 The little angels screen print on this Fiorucci Vintage Angels cropped Tee (available at Revolve Clothing) is kinda strange, but I like it. I purchased the Fiorucci sweatshirt in blue light with this print and can't wait to wear it on my road trip. The boxy sweatshirt style is a little shorter than your average sweatshirt, but the material is cozy. I'm not a crop top kinda girl, but I like this print. This angels printed tee is feminine and the pale pink shade is perfect for summer. The gorgeous and unique selection of handbags by my favorite designers this season is gonna bankrupt me. I'm addicted to handbags (seriously). I'd give up a whole lot of luxuries to purchase a few new handbags each season. Twice a year, I go through my closet and choose handbags and shoes that I don't LOVE anymore and list them on eBay - this is a great way to make some extra money, so I can afford my hangdbag addiction. I have so many amazing handbags, but the sensation of buying something new, limited edition and on-trend gives me too much pleasure. The Chloé Roy double clutch handbag (available at Chloé) was my first handbag obsession this season. The detachable clutches are linked with pale gold-tone rings. You can wear these clutches separately, BUT I'm not sure why you would - that's not exciting. 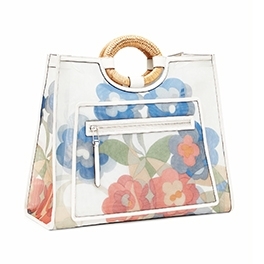 The double clutch design has a top handle and shoulder strap. 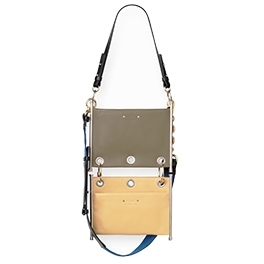 The shoulder strap is detachable and Chloé will release new colors throughout the season. I love the contrast of the blue strap against the olive green and beige leather clutches, but it's not available yet. YES, I purchased this bag in New York a few weeks ago. This unique design is a must-have Chloé handbag(s). I'm also addicted to sunglasses. Especially, Chloé sunglasses. 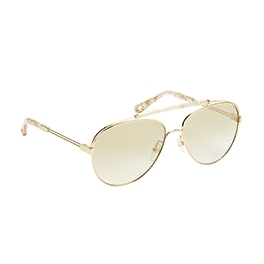 These Chloé gold-tone sunglasses (available at Intermix) have a horn brow bridge and earpiece. This design is smaller than the typical Chloé sunglass style and I do love oversized sunglasses, BUT the horn detail is a delicate touch to the otherwise masculine aviator style. I'm in to socks these days. Socks that run a little higher than my sock-style boots and socks that would look great inside pumps or sandals. Of course, if you don a sock with high-heeled sandals, it's got to be light and feminine. 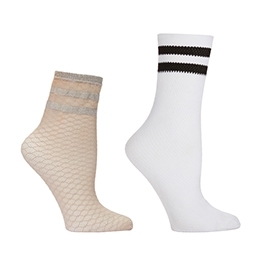 These Emilio Cavallini metallic striped diamond net socks (available at Intermix) are perfect. I have a wedding in May and plan to wear these socks with my Azure Aniline (baby blue), suede Nudistrong Stuart Weitzman sandals. If you follow my blog and personal style, you know I LOVE sock-style boots. These Emilio Cavallini varsity stripe ankle socks (available at Intermix) slightly show the white and black stripe beneath my boots and adds a little sporty-chic vibe. Pair this look with joggers and an oversized sweatshirt. The Kendall + Kylie Alana bootie (available at Revolve) is special. These shear, suede and mesh boots would look great with dresses and even joggers (yeah, I have a sweatpants obsession too). I'm not sure how I feel about showcasing my toes in a shear shoe (that can get ugly real fast), but they're gorgeous nevertheless. Fendi to me is the Porsche of handbags. Most seasons (not all of them), I watch the show, screen shot looks and wait patiently for the handbags to hit the Fendi boutiques. AND the strap you collection is amazing! The embellished straps attach to most Fendi bags - I love this! The contrast of this light brown and green palm tree-like Fendi strap (available at Fendi) against this feminine floral embellished, multi-color Fendi runway shopper (available at Fendi) is perfection. Yeah, I paired the two - they don't belong together, but look amazing holding hands. The muted flower print mesh of the shopper and jungle-esque vibe of the strap says Spring is here, nature is beautiful and I look good carrying this unique fusion of Fendi accessories. May the fashion gods shine down (or my husband) and bless me with this Fendi runway shopper and exotic strap.